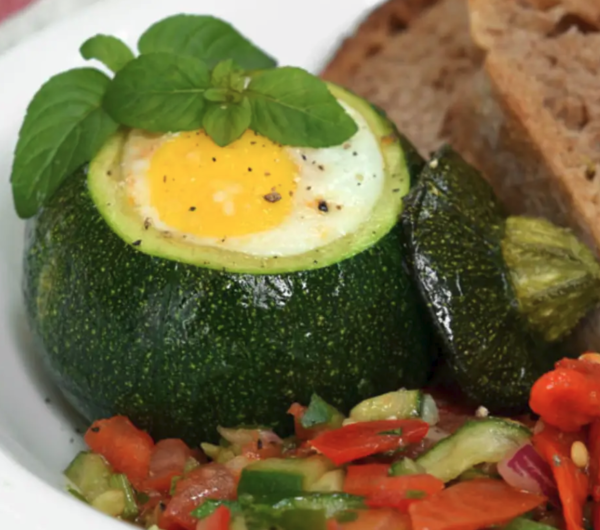 Eight ball squash stuffed with eggs and cheese, with only a few ingredients so you’ll enjoy every bite of this fresh breakfast dish. Cut the stem off the squash about 1/2 an inch from the top. Using a pointed teaspoon or melon baller, scoop out the insides of the squash, leaving a 1/4-inch thick wall on the sides and bottom. Brush the inside and outside of the squash shell with olive oil and rub the inside with a little salt and pepper. Place the squash shell on a baking sheet and bake for 15 minutes or until tender when pierced with a fork. Meanwhile, chop up the squash flesh and heat it in a pan with the tomato sauce, cooking until the squash is tender. Remove the squash shell from the oven. Spoon the tomato sauce mixture into the bottom of the shell, then add the goat cheese. Crack the egg on top and sprinkle with salt and pepper. Place the squash stem on the baking sheet alongside the shell. Return to the oven and bake until the eggs are set, about 15-20 minutes. Garnish with basil and place the stem on top or to the side of the squash. Serve immediately.